Conan the Barbarian, created in 1932, has, over the years, become an iconic figure in the American fantasy genre. Our Conan the Barbarian Cimmerian Demon Skull Dagger by Marto not only celebrates this success, but is also a licensed reproduction. Highly ornate and designed in a dark, demonic fashion, this dagger appears very-much to look like some sort of sacrificial dagger, used in acts that serve an otherwise demonic force. 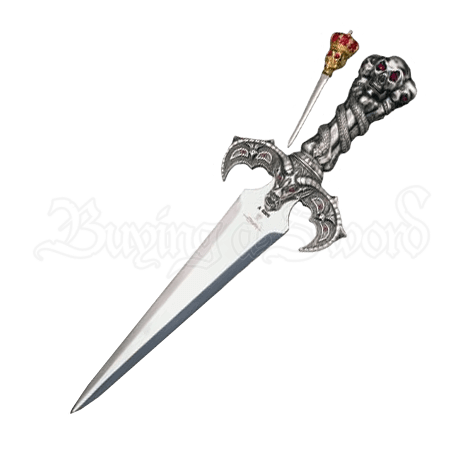 Featuring ruby-colored jewels, the daggers handle displays a trio of demons skulls. The grip consists of three bones, bound together by a coiled snake that descends down to the cross guard, which depicts a great, winged beast. Silver plating and a mirror-polished blade are not the only features, though. Perhaps the most surprising addition is the assassins blade, hidden in the crown that tops the demons skulls on the pommel. Intriguing and yet darkly appealing, the Conan the Barbarian Cimmerian Demon Skull Dagger by Marto is an excellent item for the collector looking to add an interesting new piece.